Opportunities like this are incredibly rare. Spectacularly situated overlooking Falmouths seafront and bay, Manor Penthouse occupies one of the most sought after and uplifting residential positions available in Falmouth. This unique apartment is the jewel in this impressive developments crown; the former Georgian Manor House here, having been demolished and painstakingly rebuilt to recreate the original and provide the elegance and scale of the period with exacting modern standards and luxury. THE PROPERTY At 1,868² Manor Penthouse is the largest of the 27 apartments at Gyllyngdune comprising the top floor of The Manor House. The original manor was demolished to make way for a painstaking replica of the original house, retaining its style and proportion but now with two sumptuous purposefully built apartments created within. This fabulous Penthouse apartment is accessed through double doors into an elegant entrance with wide staircase and lift access to the first floor. Manor Penthouse has a remarkably spacious interior with near 10' ceiling height throughout and a total of 11 large sash windows with glorious and varied views to three elevations and aspects. The reception room is a spectacular 36' long with four sea facing windows and a solid engineered Oak floor. The kitchen area is well defined and stylishly fitted in gloss white with flush fronted soft closure doors, Corian worktops and quality appliances. Beside the kitchen, a door leads into the large walk-in Pantry. Manor Penthouse has three large double bedrooms, two of which are en-suite, including the superb master bedroom with 17' wide bay incorporating three large sash windows for a lovely outlook. This room has a dressing area with extensive built in wardrobe space and fully fitted shower room beyond. The apartment is luxuriously equipped, immaculately presented and very practical with remarkable cupboard storage space and room to reside permanently and very comfortably. During our 30 years selling property in Falmouth, we have viewed or sold most homes along the seafront and realise this to be a remarkable property and opportunity. Apartment living in Falmouth really does not get any better than this! HISTORY The Gyllungdune estate has a fascinating history. Falmouth in the early 1800s had little but a pedestrian cliff path running along the seafront and very few buildings had been constructed. In 1838 the Gyllyngdune Estate was acquired by Rev. W.J. Coope who became the rector of Falmouth. In 1840 the Rev. Coope constructed the original house and a small building on the seafront known as the chapel. After the Rev. Coope's demise, the estate changed hands for £10,000 to a famous mining entrepreneur, Sampson Waters. The estate remained in the Waters family until 1903 when the property was sold to Falmouth Borough Council, enabling them to connect the town via the seafront by building Cliff Road, which has previously terminated at the Gyllyngdune Estate. In 1904 the estate was used as a pleasure and winter garden. The grotto and further land were purchased in 1907 and the garden was officially opened to the public as the Princess Pavilion in 1910 by Princess Alexandra. THE LOCATION Completed in 2010 Manor Penthouse occupies one of the most sought after, valuable and uplifting residential positions to be found anywhere in Falmouth, set back from the seafront, overlooking Gyllyngdune Manor's established gardens and grounds and out to sea, taking advantage of glorious southerly views across Falmouth Bay to the infamous Manacles reef. Its location is superb, situated on the town's seafront and southern side, with Castle beach right ahead, Pendennis Castle and Point to the East and a few moments' walk to Gyllyngvase beach and café, along the coastal path to Swanpool and Maenporth beaches and beyond to the Helford River. Manor Penthouse is remarkably convenient to the town and harbourside where there is an excellent and diverse selection of restaurants and an eclectic mixture of individual shops as well as national chains, together with quality galleries showcasing local talent. Nearby train stations (Falmouth Town and Penmere Halt) provide a convenient link to the mainline at Truro for Exeter and London, Paddington. Falmouth Docks are a major contributor to the town's economy and along with Falmouth University (with campuses in Falmouth and Penryn) and Falmouth Marine School, specialising in traditional and modern boat building, marine engineering and environmental science, ensure an all year-round vibrant community. There are five primary schools and one secondary school in the town and another in Penryn as well as highly regarded independent preparatory and senior schools in Truro. Falmouth boasts the third deepest natural harbour in the world and is renowned for its maritime facilities which offer some of the best boating and sailing opportunities in the country. Falmouth is consistently ranked as one of the top five places to live in the UK. UTILITY ROOM Space and plumbing for washing machine and tumble dryer. Built-in cupboard housing Electric Consumer Unit. Power points. LIVING/DINING ROOM & KITCHEN 36' 6" x 17' (11.13m x 5.18m) and with 9' 10" (3m) ceiling height. A fabulous room with four large, sea facing, double glazed sliding sash windows overlooking the developments lawned garden and seafront out into Falmouth Bay and towards the Manacles Reef. A further large double-glazed sliding sash window with a further aspect to Bay around to Pendennis Point and Ships and Castles leisure centre with the Roseland Peninsula beyond. Flooring in solid engineered oak. Two radiators, access to loft space. Spotlit and twin rise and fall lights. KITCHEN Incorporated within the room and defined by a base island unit in gloss white with flush fronted, soft closure doors. 'Corian' work top and stainless steel and tile splashback. Appliances including a 'Siemens' dishwasher, 'Gorenje' integrated fridge and freezer, 'Siemens' stainless-steel double oven, grill and microwave, 'Siemens' five element gas fired hob, stainless steel splashback and large extraction. Sink and monobloc tap. WALK-IN PANTRY 9' 8" x 5' 2" (2.95m x 1.57m) Continuation of oak floor. Gas wall mounted boiler fuelling radiator central heating and hot water supply. Shelves. MASTER BEDROOM SUITE 20' 6" x 12' 5" (6.25m x 3.78m) plus entrance and dressing area incorporating extensive wardrobe space with sliding door access. EN SUITE SHOWER ROOM Full ceramic wall and floor tiled. White three-piece suite with button flush WC, wash hand basin and walk-in corner cubicle with boiler fed overhead rain shower. Heated towel radiator. Recess with overlit mirror and shelf. Spotlit ceiling. Shaver point. EN SUITE SHOWER ROOM Full ceramic wall and floor tiled. 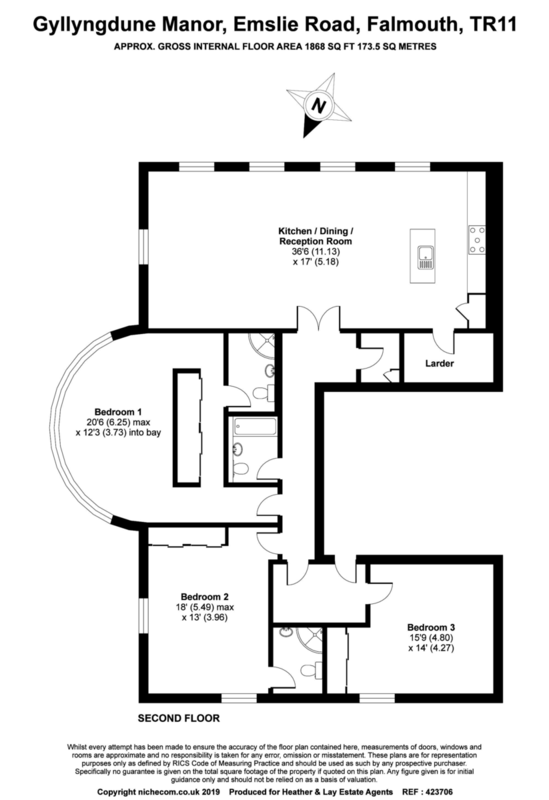 White three piece suite comprising button flush WC, wash hand basin and walk-in corner cubicle with boiler fed overhead rain shower. Heated towel radiator. Bevel glazed mirror and shelf. Spotlit ceiling. Shaver point. MAIN BATHROOM Full ceramic wall and floor tiled. White three-piece suite comprising button flush WC, wash hand basin and tile panelled bath with boiler fed shower and folding glass screen. Heated towel radiator. Recess with overlit mirror and shelf. Spotlit ceiling. Shaver point. OUTSIDE The lovely communal gardens and grounds retain established features from the original Gyllyngdune Estate with mature Holm Oak and Fir Trees as well as the expansive lawn leading down to the seafront. PARKING The Manor Penthouse has one designated parking space. SERVICE CHARGE £3,329.40 per annum. A copy of the lease is available on request.